Dinosaurs are a theme that little learners always seem to enjoy and stay engaged in. Right now my preschoolers can’t seem to get enough of dinosaurs! They pretend to be dinosaurs on the playground, create the most imaginative dinosaur environments in the block area, and can name more dinosaurs (and pronounce the names correctly!) than I can. 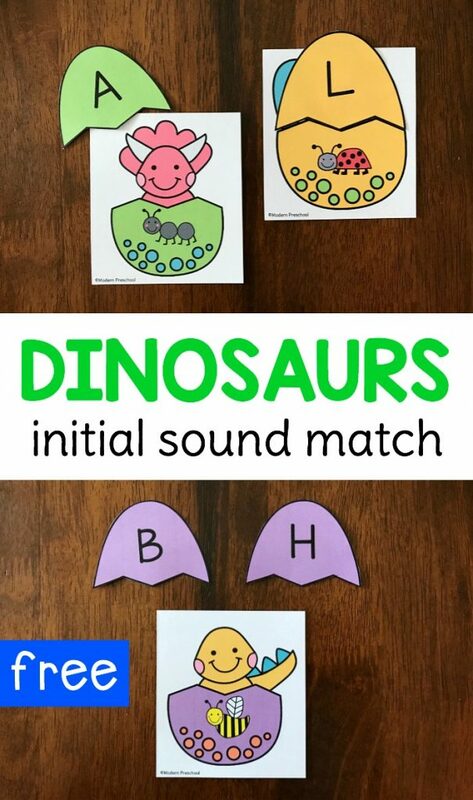 Building off of their interest was easy to do with our free printable Hatching Dinosaur Eggs Initial Sound Match activity to use with our literacy centers! Affiliate and referral links are included in this post. 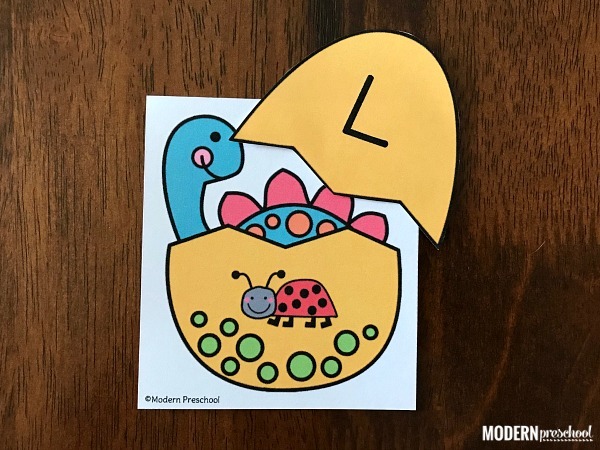 This free printable dinosaur themed activity can easily be added to a literacy center or used as a reusable busy bag at home. It includes 26 dinosaur egg cards and 26 egg top cards. The dinosaur egg cards each have an initial sound picture on it. Each dinosaur egg top has a different uppercase letter on it. Print the file from the pink button below. Cut the dinosaur egg cards out on the gray dotted lines. Cut the egg tops out around the black lines. If you are going to laminate set, I prefer to laminate the egg tops first and then cut them out. I love how versatile our Hatching Dinosaur Eggs Initial Sound Match activity is! Many of my preschoolers are rocking letter sounds and found this activity to be right on their learning level. This group played with the entire alphabet at once. Some of my preschoolers are still focusing on letter recognition, but understand the letter and sound relationship. For those kiddos, I pulled out a few dinosaur egg initial sound pictures at a time to play with. I was able to focus on letters that were already mastered to set this group up for success. No matter how you differentiate this literacy center, the goal is the same. Match the initial sound in each picture to the correct letter. In my classroom, we practiced identifying the picture and then saying the sound at the beginning of the word. A lot of the time they will whisper the sound over and over until they can figure out the letter. Continue to play until all dinosaur eggs are matched up correctly! Dinosaur books are always a huge hit with my preschoolers. My preschoolers love how silly they can be. I love how some of our favorite books teach friendship and life skills. You can follow this link to find a list of dinosaur books to bulk up your dinosaur theme. 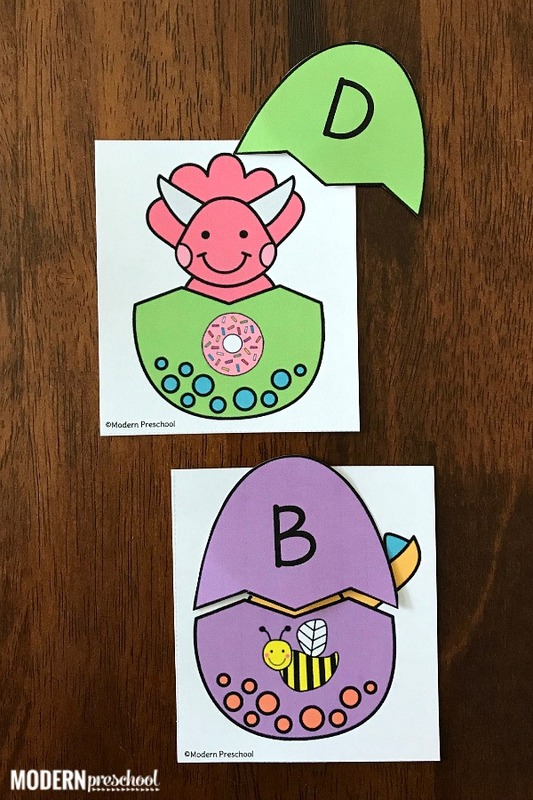 Before you download your own copy of our Hatching Dinosaur Eggs Initial Sound Match activity, you have to check out these dino-tastic activities from some of my favorite go-to bloggers! 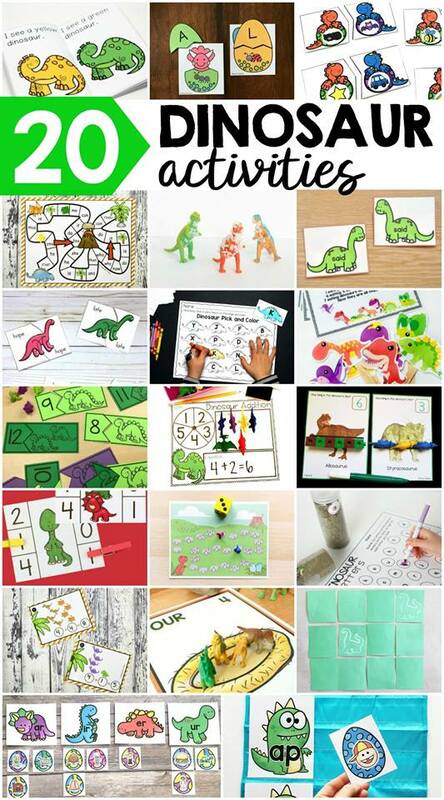 Free Printable Dinosaur Emergent Reader // Fun A Day! Grab your set of our Hatching Dinosaur Eggs Initial Sound Match now!